1. 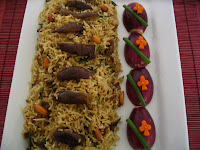 Slit the brinjal and put in the water diluted with 1 tbsp milk so that it will turn color. They should be slitted to 4 or 6 leavening the top portion uncut. So that they remains the whole shape with the slits. 2. Take a teaspoon of oil in the frying pan and fry the dhals, coriander seeds , jeera, fenugreek, chillies everything one by one till roasted golden brown and make a powder out of it by adding the coconut too. Keep it aside. 3. In a wide frying pan add some oil saute the onions and vegetable. 4. Fry until they are slightly brown and add the tamarind extract. 5. Once they get cooked add the ground powder, tumeric, salt , jaggery and enough water. 6. Cook for sometime. Once they are slightly thickened. Season with 4 tbsp oil and mustard , curry leaves. 1. This tastes so so good next day too. 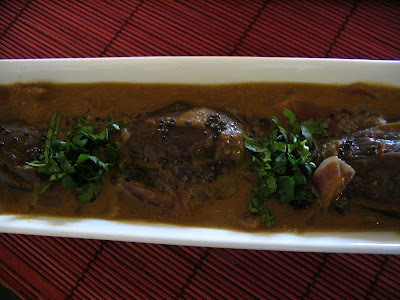 All the flavors gets incorporated into the brinjal and taste awesome. 2. To reduce the cooking time you can add the veggies, onion saute in the pressure pan add all other ingredients with 4 tbsp of oil pressure cook for 1 whistle keeping in high flame then season with mustard and curry leaves. This procedure saves time too. One of my favorite kuzhambu.looks so yummy.Nice presentation. Thanks kalai for letting me know.. 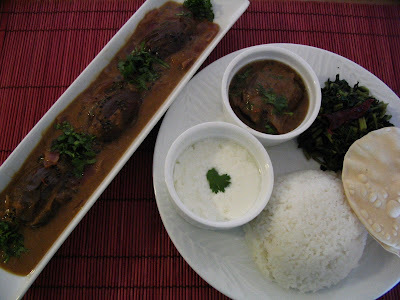 This looks really beautiful I love the long dish you serve i in and the rich brown colour of the sauce is so appetizing to me as I love dark sauces YUM. wow never tried this pulusu but it looks all yummmm.....will give it a try sometime!!! I just bought baby eggplants from the farmers market, this looks great to try! Looks so delicious! I rarely make something with eggplant. Loved the dark colour of the gravy and the serving dish. That is a lovely meal! wow! my fav..love it with taro root curry! the pic looks so inviting! I liked your blog very much.I appreciate for the wonderful presentation with mouth watering photos.I will definitely try this recipe.Now I have become your follower so I will be visiting your blog. Love eggplant and this is one of my favorite kuzhambu. Looks delicious and a very nice presentation. I'm not too fond of brinjal. But I do like all the blend of sour and spice in most dishes. I just love this..Nice combo with rice...pass me that plate for lunch today.. This is in my to-do list for a long time. Tempting presentation as usual. You are right. They are delicious.I don't use onions.Shall try with onions next time. 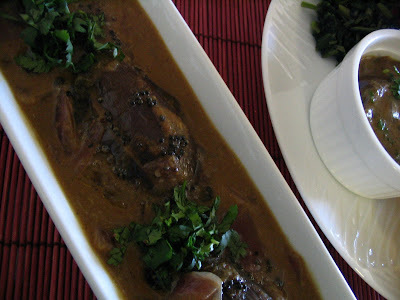 Wow.. looks soo tempting and spicy... chala bagundi..lovely presentation dear!! Oh... wow.. looks droolworthy. Good one. Anything with banana...and am in for it.Lovely one! Well spread..Love eggplant, and this looks delicious. I've never heard of this dish before! 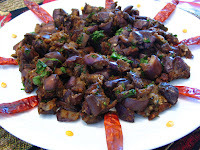 I love eggplant and tamarind - I would love to try this. It looks delicious! is it the eggplant week? kidding..love the curry and the decor as usual is simply fab! Ulli vankaya pulusu makes me drooling. Nice presentation. oh!ur eggplant looks soo tempting..
Yummy ! mouth watering dish. Lovely presentation. Especially the bowl u served. Eggplant in tamarind sounds delicious! never tried this though, will definately try once! wow what a presentation pavi looks great and delicious recipe mmmm mouthwatering. So yummy & lovely presentation! looks awesome... i love eggplant in any form.. and kathirikai kuzhambu is a classic.. this platter looks very pretty!! 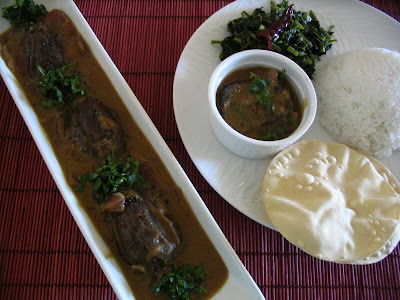 Pavi dear...The pulusu looks awesome...I love this dish. Just made it a couple of days back. Your choice of kitchen vessels and the way you present is fabulous. Really really a big kudos for your great efforts.. I always salivate when I hear this dish's name - perfect in every way. wow, this is so mouthwatering. awesome presentation! yummy recipe...great combo with rice!